Ms. Hadfield and our firm's president, Chad M. Johnson, use their combined nearly 50 years of experience to help the clients who come to our Reno law office for assistance. Armed with knowledge, they help Nevada residents find solutions to even the most complex financial problems. 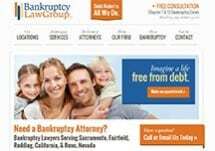 Whether your current situation requires a Chapter 7 or Chapter 13 bankruptcy or it allows for another debt relief option, look to Bankruptcy Law Group, PC, for guidance upon which you can depend. Our lawyers will take the time to carefully examine your financial situation, ensuring the option you pursue is the best fit for you and your family. By scheduling a free initial consultation at our Reno law office, you can get started on the road to financial security.